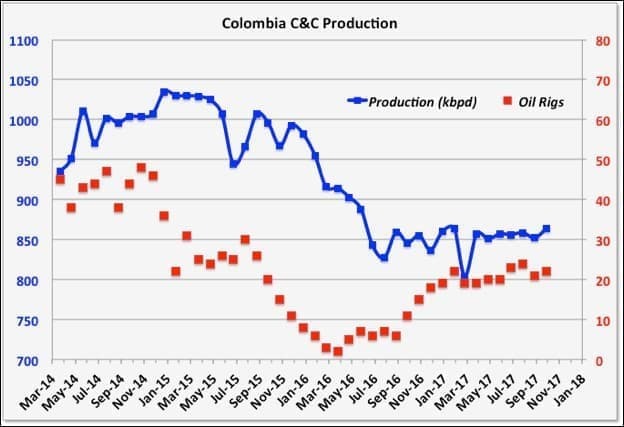 This post covers recent C&C production and future prospects, with a bit on gas, for several mid-size non-OPEC producers. A few have been omitted (e.g. Canada, Kazakhstan, Egypt, UK) for no particular reasons other than lack of time or anything much to say, but may be covered in the future. Many of the countries here have held a bumpy plateau over the last twelve to eighteen months. For most this has come after a period of decline, and some are showing signs that decline might be starting again. Brazil has been on a plateau after a period of increase, and may be about to renew that growth. 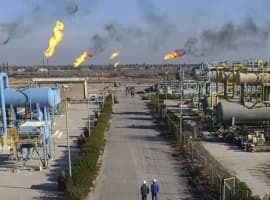 There is a general theme that oil discoveries and developments are drying up and most of the countries are looking more to gas, but with the current gas glut looking like it might end up worse than the 2014/15 oil glut that strategy may prove difficult in the near term. Brazil production peaked in March and has been on a plateau since (data below is through July, there should have been an August update but ANP aren’t very consistent in release dates). They have had several large FPSOs offline for maintenance (generally their FPSOs don’t have the best availability and they have had recent common mode failure issues with the high-pressure gas risers, though I don’t know if this is a direct cause of the recent turnarounds). The Campos fields’ average water cut seems to be accelerating, which might also be contributing to a plateau rather than allowing a new peak. All the new production growth is coming from the Santos basin. PetroBras production contributes about 82 percent to the total, but gradually falling as the new Santos production is partly foreign owned, e.g. by Shell – one reason they bought BG, and may fall faster now as PetroBras are trying to divest older fields. Its figures come out quicker than ANP and they report a new record in August, but falling slightly in September and October. They have bought the Libra extended test production on-line this month which will add production, and give some indication of future expectations. There are ten new, large FPSOs due through 2021, and a couple of others possible, which would altogether add about 1.5 mmbpd extra nameplate. 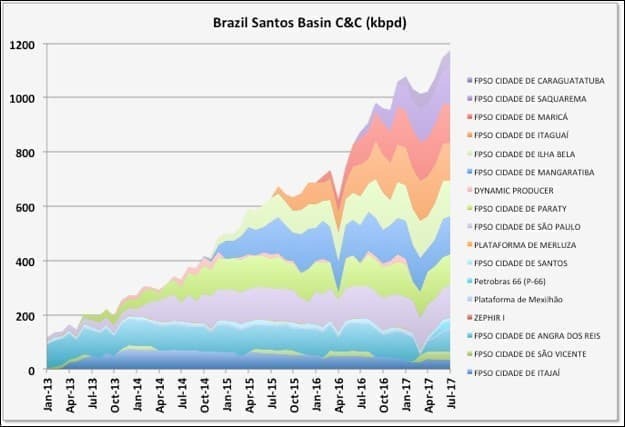 However, the overall decline rate now indicates they need about three major new projects per year just to maintain plateau, and if the Campos FPSOs’ performance is repeated then the earliest Santos facilities should start to decline this year or next, and can go quite quickly. 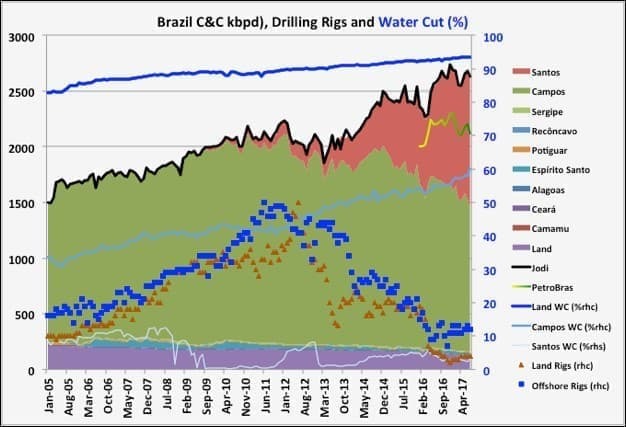 Data from: ANP and PetroBras. 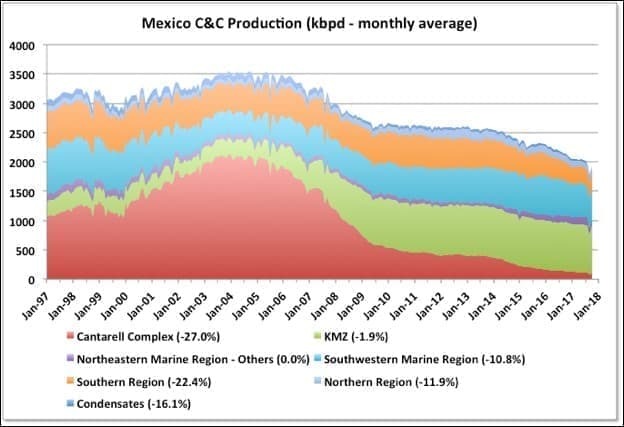 Mexico had a big drop in September production because of hurricanes and planned turnarounds, which has mostly been recovered, but they still continue on a general decline, losing an average of about 15 kbpd C&C per month from August to October (10 percent y-o-y drop from October 2016). With KMZ showing more signs that it might be coming off plateau this may accelerate (i.e. Ku field looks to have recent gas breakthrough and overall y-o-y decline is up to 1.9 percent). Abkatun-A2 is due on stream in 2019 (a replacement for a previous platform lost to an explosion and with 60 kbpd nameplate) and there were some recent significant discoveries that should add production in 2021 or so provided the appraisal drilling is successful. There have also been some onshore discoveries that could be brought on-line quickly, but Pemex just seems to keep on losing money so CAPEX funding could be a problem. Norway data is through September. They are in slight decline this year, which has accelerated recently because the Goliat platform is being held offline for safety reasons. Gina Krog (60 kbpd nameplate) is ramping up and Maria (40 kbpd) started this month. The other recent start-ups are showing fairly early and relatively steep decline. 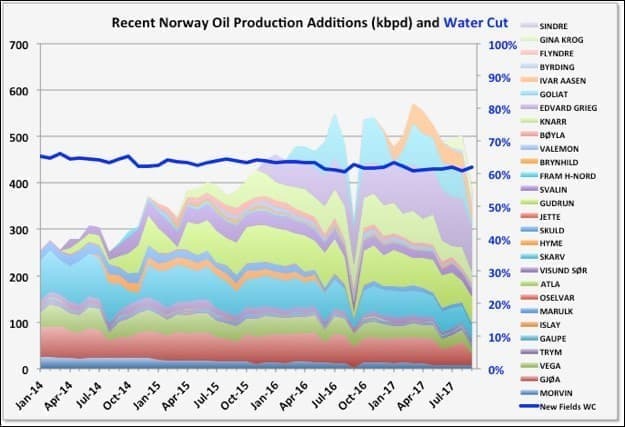 There’s no new oil due in 2018 but about 140 kbpd in 2019 (in particular Martin Linge and Oda) and then more than 300 kbpd to start ramping up in 2020 when Johan Sverdrup comes on-line. Martin Linge has had problems and this month Total sold its stake to Statoil, who take over operatorship. Data from: NPD Fact Pages. Colombia is holding a plateau that will allow them to meet this year’s target of 840 kbpd. 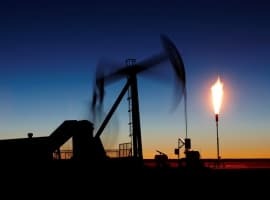 There isn’t much else immediately in prospect but plans for more offshore drilling, which has so far been disappointing, and shale development. Data from: Colombia Ministry of Mines. China has had some success in arresting their decline rate, but have a lot of ageing fields which use various EOR methods and only a few, smaller, offshore fields in development. There’s quite a bit of exploration activity in the South China Sea. Data from: National Bureau of Statistics of China. 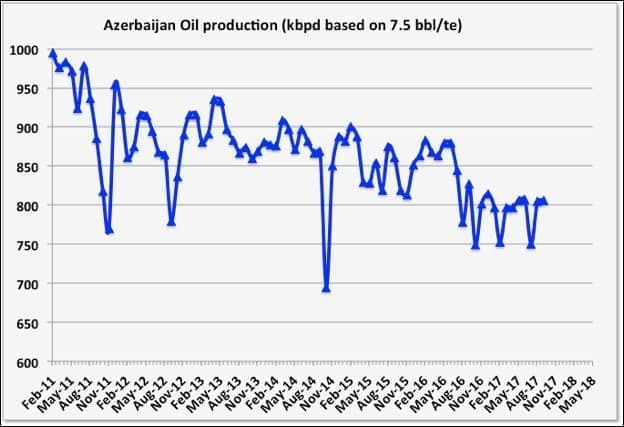 Most Azerbaijan oil production comes from the BP operated offshore Azeri-Chirag-Gunashi facilities, and it is declining pretty much in line with the original production application for that development. There isn’t much additional oil in the pipeline but Shah Deniz II (also BP), a large gas field has just started and will add about 50 kbpd condensate, and a similar Total project, Absheron, is in early engineering and due to start-up in 2021. All the producers shown are oil importers except Oman, with Indonesia, Vietnam, Thailand and Malaysia switching from exporters in the last fifteen years and India and Australia showing rising import rates in the same period. Data from: Jodi, EIA, IEA and OPEC. Oman has a nice new data and statistics government website but seems to have forgotten to employ anybody to keep it updated, so there’s no production data there after May. They also stopped reporting to Jodi last year but, as with all countries I’ve looked at, EIA estimates look pretty good. They have been meeting their commitments to NOPEC cuts and holding at 970 kbpd. It’s possible, however, that this cut is hiding a peak in C&C production, as they redeveloped some pretty mature and declining, heavy oil fields starting about ten years ago using various EOR methods, including miscible gas, chemical and steam injection projects, and those gains were obviously fading before the cuts. They have some new gas developments, e.g. the Khazzan tight gas project for BP at 200 kboed started in September, but no major oil developments, and nothing big on the cards (Yibal Khuff is a small field at 10 kbpd due in 2020). India is holding a plateau, but never seem to meet monthly targets. 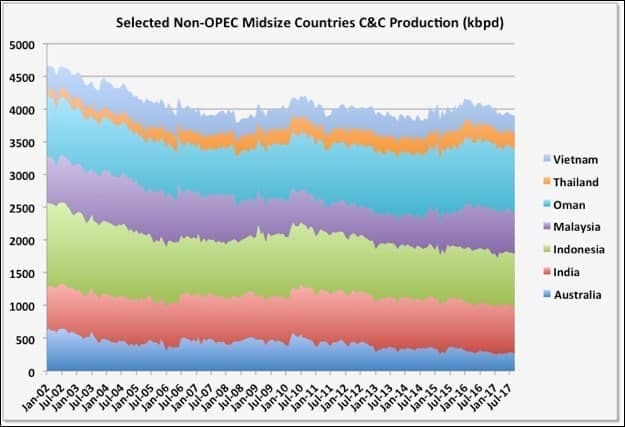 They don’t have much new oil production in development (one platform at 75 kbpd due in 2020, and some smaller shallow and heavy oil facilities) and seem to be switching over to concentrate on gas, like a few other countries. 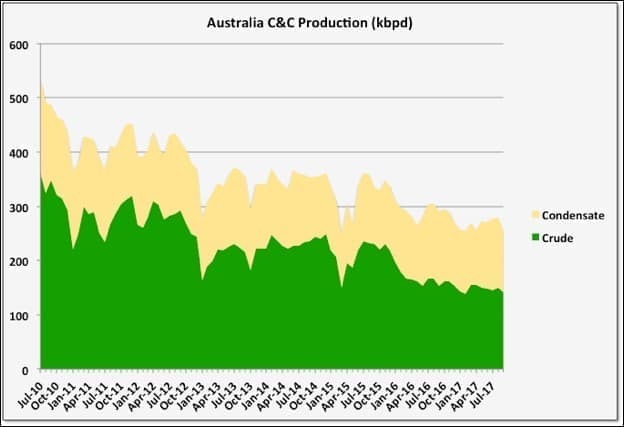 Australian oil production is in terminal decline. 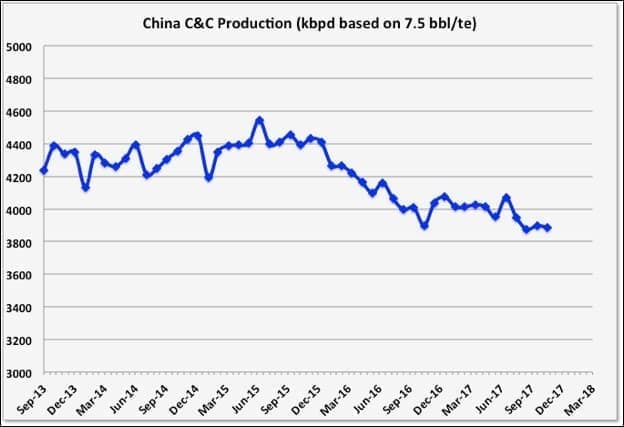 A large proportion of their production is condensate, which has been holding steady, so all the drop is in the crude, which is falling at about 15 percent per year. A small offshore development, Greater Enfield at 12 kbpd, is due in 2019, but they have potential for natural gas both offshore and onshore (with tight gas and coal bed methane). Data from: Australian Petroleum Statistics, Commonwealth of Australia 2017. Vietnam oil production is in terminal decline at around 8 to 10 percent per year, and gas production may have peaked this year. The Ca Rong Do project (a tension leg wellhead platform and chartered FPSO at 30 kbpd) is due in 2020. I haven’t heard much about new exploration but there has been a dispute with China in the South China Sea, which is supposed to have been rectified and may open up some offshore prospects. Thailand is the smallest of the producers shown and has held a plateau for eight or nine years at just above 200 kbpd. It doesn’t have much in prospect for new developments and exploration has been a disappointment recently. Malaysia has high quality, light, sweet oil (its Tapis grade is among the priciest) and is a large LNG exporter, though gas production looks like it may be plateauing. 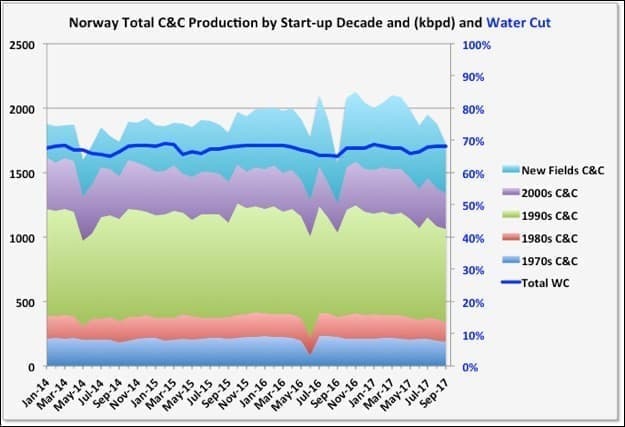 C&C production has increased from a low in 2015 but is now again in decline with nothing major due for oil after Malikai completes ramp-up this year (60 kpbd, Shell operator), but some smaller gas developments. Almost all discoveries since 2012 have been gas or gas-condensate. There are prospects for deep-water exploration and EOR on some of the mature fields, but these probably need much higher oil prices. Indonesia had Banya Urip extension, large ExxonMobil oil project, ramp-up last year but is now back in decline. There are some small oil tie-backs due in 2019 at Natuna. 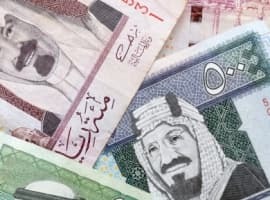 The government has promised to attract $200 billion investment to try to stop its production declines, for both oil and gas (in which it has been a major producer but peaking in 2001). However so far there hasn’t been much to show for this. East Natuna is a huge gas field development ($40 billion estimate) that ExxonMobil recently pulled out of saying it wasn’t commercial in current conditions. Masela (Abadi) is another multi-billion project for LNG, much delayed but possibly now in pre-FEED with Shell and Inpex. Ande Ande Lumut, is a heavy oil development that looked likely to go ahead but the operator has now downgraded the resources from 2P to contingent. Other prospects are mostly gas. The small gas-condensate field, Madura BD at 110 mmscfd and 6 kbpd condensate, started up in August.